While we were able to see most of the other players twice, Budinger was only working out the first day. The first thing you notice about him is his sizehe really does have great height to play on the wing, at either the 2 or the 3. His frame also appears to be capable of adding weight, and from what were hearing hes also measuring out extremely well on all the various agility tests hes taken in the workouts hes been at. In the drills, Budinger was outstanding, showing picture-perfect shooting mechanics and knocking down his jumpers at an impressive rate. He was slightly less impressive in the three on three portion of the workout, though, having a difficult time matching up with the extremely strong and athletic Paul Harris, who was clearly a man on a mission in these two days. Defensively, Budinger will need to improve on his fundamentals, as he often appears too upright in his stance. Budinger is an interesting prospect in this draft, as he brings a nice combination of upside and current productivity to the table. You know what youre getting from him in terms of his ability to shoot the ball, operate in a team setting, and generally know how to play the game. Its possible that a good coach in the NBA will be able to extract even more from at the next level, though, especially if he can get him to play with more toughness and aggressiveness than hes currently known for. Chase Budinger has picked up right where he left off last season, making some slight advancements in his game and having no trouble adjusting to his slightly larger role on the Wildcats. The versatile and athletic wingman has made small improvements in his points, assists, and three-point shooting percentage, and shows no sign of slowing down as conference play begins. Budingers scoring actually was above his season average in Arizonas three games against ranked opponents thus far (#2 Memphis, #4 Kansas, #9 Texas A&M). Budingers style of play hasnt changed much in his sophomore season, but hes getting things done slightly better in a few areas, most notably from behind the three-point arc. With his near-textbook form, boasting a high, quick, and consistent release on his shot, Budinger is shooting a very solid 40% from behind the arc, up from 37% last season. Hes been equally effective spotting up and coming off screens, doing some damage in that vein from the 15-18 foot range as well. He still isnt nearly as dangerous when pulling up off the dribble, but hes making more of an effort to incorporate that into his game, getting off quite a few shots in that manner from the 15-18 foot range, though having inconsistent success with it. In terms of taking the ball to the basket, Budinger still isnt a great threat in isolations, but his improving ball-handling and ability with both hands bodes well for his future success. His handle is fairly tight, even though its not especially low to the ground and he doesnt use many advanced moves. Because of such, he struggles splitting double teams and dribbling in a crowd, but looks very comfortable in space, either coming off screens with the ball, finding open space on the floor, or handling in transition. Budingers dribble-drive game should benefit from the extra spacing on the floor in the NBA half-court game, due to the deeper three-point line, along with the tougher scrutiny on perimeter defense by referees, similar to the way Rudy Gays dribble-drive game has improved in the NBA. Budinger has continued to show his excellent motor and basketball IQ on the offensive end of the court, constantly moving without the ball, making good use of screens, and getting out in transition. He finishes well in transition, and also has shown some nice passing proficiency there, with his assist totals up on the season. Budinger would be best off if he was drafted by a team with an up-tempo style, as his ability to play in space would best be utilized on a team that tries to catch defenses off guard. On the defensive end, Budinger has continued to play well this season, though its worth noting that his motor is not as consistent on this end of the court, yet its still very solid. His perimeter defense is heavily reliant on his lateral quickness, as hes not very physical, with his game being almost entirely based on beating his man to the spot. His lateral quickness is good, but he is a bit stiff in the hips and he doesnt have the lowest center of gravity, so hes likely best suited to defend small forwards at the next level, provided his body can handle some extra bulk, which it should be able to. Budinger is also prone to overplaying at times on defense, either over-rotating while leaving his man open off the ball, or overplaying in man-to-man defense, leaving him prone to quick crossovers. To his credit, he recovers well when he gets beat, sometimes being able to move laterally and still get in front of his man on the second effort. Theres a very good chance Budinger will enter the draft this season, and if he does, he should be firmly in lottery discussions. With his work ethic, athleticism, and foundation of skills, he should be a fairly low risk prospect, likely amounting to a solid starter at worst. His continued improvement and learning curve will determine how high his ceiling is, though he doesnt seem to have the mentality to ever be a #1 option scorer. Adding some strength, extending his shooting to NBA three-point range, and continuing to improve his ball-handling should be his main priorities at this stage. Chase finished his impressive freshman year by playing an average game by his standards. He was very assertive in the first half, not really making any mistakes, but also not looking to take a huge offensive burden on his shoulders. In the 2nd period, with Arizona trailing, he became more aggressive looking to score, but had poor results as he turned the ball over a few times and forced some tough shots. The best part of his game today was his passing, which was remarkable even though he was credited with just one assist. Budinger showed great court vision creating numerous good looks for his teammates, which they did not convert for the most part. He mostly settled for outside jumpers today, which were not falling at his usual clip, but his form and touch are very good as evidenced by his season averages of 48.6% from the field and 37.1% from behind the arc. Budinger gets in trouble when he tries to get too fancy with his dribble, and he doesnt have much of a mid-range game at this point. He played passable defense in this game, usually guarding players that were a few inches shorter than him, but was still able to prevent dribble penetrations most of the time. Chase crashed the glass with his impressive leaping ability and finished with 6 rebounds, but his team could certainly have used even more of his help in this department today, particularly on the defensive end. Budinger remains one of top wing prospects in the country thanks to his outstanding physical attributes, reliable outside shot and good understanding off the game. It would be interesting to see Chase in more of a go-to role at Arizona next year, when he will be called to do more things on his own. He says hes returning to school for another season, and although we love his potential, it certainly will help him long-term to continue to add experience and polish to his all-around game. A former volleyball player that has seen his stock skyrocket over his last year in the prep ranks, the curly redhead Budinger may not look the part of emerging NBA standout. Nonetheless, few players anywhere can boast Budingers combination of athleticism and outside shooting ability. He is a truly elite leaper, ferocious in the open court and winner of the McDonalds All-American dunk contest, but his emergence as a shooter has put him in this elite class. Budinger recently dominated the international competition in Douai (he won tournament MVP), and is going to be an instant star for Lute Olson. He is an over the top athlete with NBA 3-point range. The Arizona system was custom built for him. Budinger still needs to work on his in-between game and add strength, but the fact that he has improved so much in recent months bodes well for his future development. The Wildcats already have several other potential NBA players vying for time at the wing this fall, but it may not matter. 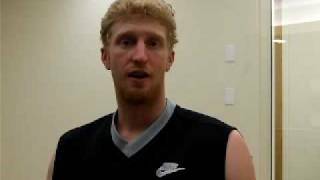 Chase Budingers star is on the rise, and it may land him in the first round as early as 2007.